DeKalb County Court form in Georgia for jurors whereas a filer found a surprising and unpleasant suggestion when he was typing in a search for his occupation: slave. Listed on the Jurors forms for possibly as long as the last 13 years. A Black LA Judge is profiled and detained by UCLA police while on the same campus Black BRUINS protest a decided lack of diversity. We will candidly discuss how slavery is alive and well in the United States of America. In the Overseer Chronicles, we report on a Florida store owner who after realizing that his black customers were being harassed by police, decided to take matters into his own hands. He installed several cameras catching the racist Miami Gardens cops who were harassing and terrorizing both his black employees and customers red handed. Our profile in abolitionism is David Walker 1796-1830. Walker was a radical Black abolitionist who wrote against published assertions of black inferiority by the late President Thomas Jefferson, who died three years before Walker's pamphlet "An Appeal to the Colored Citizens of the World". A woman and her children were fired on by police. The ACLU produces study showing thousands of non-violent people convicted of non-violent crimes sentenced to a life time of incarceration. Our profile in abolitionism is Solomon Northup (1808-1863). Download Podcast Tonight on New Abolitionists Radio we hope to speak with Jamie Trinkle, who is the lead campaign manager on the Private Prison Divestment campaign promoted by Nation Inside. The Private Prison Divestment Campaign was convened by Enlace in 2011. Last year, Nation Inside graciously offered to promote this campaign on their website, a consolidated online platform for community campaigns engaged in different pieces of the struggle against the prison industrial complex. Divestment was an important tool in ending the apartheid regime of South Africa and can be just as an effective tool in shutting down the private prison industry. Western Tidewater Regional Jail in Virginia is trying to get back lost federal dollars associated with holding federal prisoners. Whether it is a private company or an entity of government, big money is the name of the prison industrial complex game. In the Overseer Chronicles, we will highlight the so-called War on Drugs and the 53 drug convictions dropped in Philadelphia because of corruption in the police drug units in the city. Our profile in abolitionism is Leonard Andrew Grimes (1815-1873). We welcome new abolitionists host Yohanan EliYah tonight. The GEO Group enslavers held one of their annual conference calls today bragging about their profits from 21st Century Slavery and Human Trafficking. We will break down the call. We will also discuss the Corrections Corporation of America's lawsuit against states for violating their contract to keep the prisons full. The Overseer Chronicles: The Texting Texas Judge. Tonight's abolitionists profile is David Ruggles (1810-1849). New Abolitionist Radio will discuss how deeply embedded the lie of the 13th amendment ending slavery is in our history and psyche. Max Parthas says, “The most legitimate and accredited people and educational institutions of this nation support a bold faced lie. I'd like to know why. I'd also like our listeners to start challenging this concept openly”. The Thirteenth Amendment horizontal rule “Neither slavery nor involuntary servitude, except as a punishment for crime whereof the party shall have been duly convicted, shall exist within the United States, or any place subject to their jurisdiction.” On January 31, 1865—two years after the presentation of the Emancipation Proclamation, and three months before the end of the Civil War—the Thirteenth Amendment passed through both houses of Congress, ending almost 250 years of slavery in the United States." Today the President gave a speech in Washington DC at the Let Freedom Ring event held to mark the 50th anniversary of Dr. Martin Luther King’s “I have a dream speech” and the he certainly did his part to further the myth of slavery being abolished by mentioning that he was standing in the shadow the great liberator referring to Abraham Lincoln while he gave his speech. We will also share some of the latest news involving slavery and 21st Century slavery. Tonight’s featured abolitionist is Robert Purvis (1810-1898). Kenneth Kabbal joins us on tonight's broadcast of New Abolitionists Radio. He is the founder of Evilforalltime.com and a outspoken multimedia journalist with an ongoing mission to address "Class Domestication" and "Social Mind-Lock". Kenneth is a 21st Century New Abolitionists and after hearing our broadcast on the GEO Group's 2nd quarter profits, he sent us a message stating that he will make every effort to "broadcast their slave-master message" across his blog. Kenneth has also uncovered some interesting information about Wells Fargo's role in the slave trade back in the early 1800s and they continue to do be a part of 21st Century Slavery & Human Trafficking. Detroit Artist & Activist Chantay Legacy Leonard, Social Activist & Spoken Word Poet Max Parthas and Black Talk Media Project founder Scotty Reid will also share some of the latest news related to legalized human trafficking and slavery. Tonight’s profile in past abolitionists features Amos Gerry Beman (1812-1872). Download Podcast You would think that US Attorney General Eric Holder had announced an end to the mass incarceration of Black people by the way some people have reacted to proposal to end federal mandatory minimums for certain people convicted of drug offenses. More sober analysis reveals that what is being proposed will not make a dent in mass incarceration in America. Today we will be joined by Adam 'Henzbo' Henze is a professor and poet. He is a volunteer with a program called 'angel's wings' at the Indiana women's state prison (we donate supplies and host baby showers for expecting incarcerated mothers). He was a featured artist in the 2010 Lizz straight ministries prison tour and has taught workshops at the cook county juvenile detention center in Chicago, at the Arkansas juvenile assessment and treatment center. He was a presenter at the 2009 juvenile justice educators and trainers annual conference in Indianapolis. Tonight’s profile in past abolitionists features John Sella Martin. This and more on tonight's broadcast. The GEO Group, Inc. GEO -0.11% ("GEO") scheduled a conference call today for it's second quarter 2013 financial results. Members of the group Move To Abolish Prison Slavery joined the call to gather intelligence and get a inside look at the world's second largest prison en-slaver and human trafficking corporation. Join us tonight at 8:00PM EST for our regular scheduled broadcast as break down the conference call statement by statement. We will also welcome our new co-host Legacy Leonard to the show. Our profile on a past Abolitionists is Martha Browne. Among the things we will discuss is a the death of the first California Prisoner hunger striker, celebrities who have joined in calling for an end to the practice of isolation/torture, a planned electronic protest of one the country's largest human traffickers. Stayed tuned for our weekly spotlight of a past Abolitionist as we highlight John Woolman. 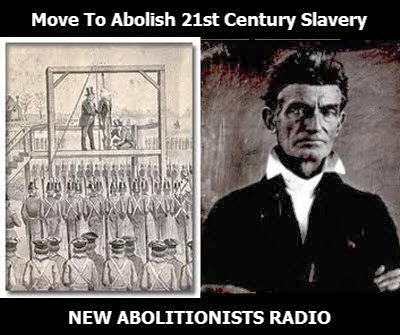 Tune in as Max, Aset and Scotty share their views and news on the issue of 21st Century Slavery and Human Trafficking and of course a profile of a past Abolitionist. We will be joined by Minister Server Tavares –aka- The Hip Hop Life Coach. He is a true Hiphoppa, who has spent over 25 years dedicated to the development, growth and preservation of Hip Hop culture. Since 2003, He has been a spiritual adviser of “The Teacha-KRS-One”, and Lead Minister and National Organizer with the Temple of Hip Hop MA.S.S. movement. Stayed tuned for our weekly profile in Abolitionism as we highlight Denmark Vesey. 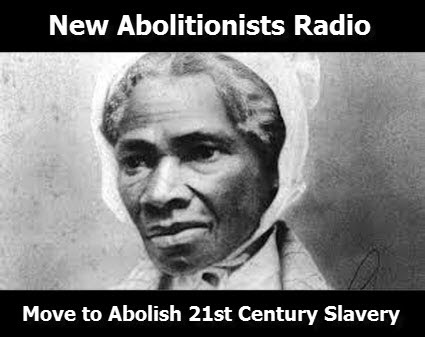 Join us on New Abolitionists Radio as we discuss the issues and recent news related to 21st Century Slavery. Tonight we are looking back at the travesty of the so-called jury trial of George Zimmerman. We want to examine the role of juries in America in maintaining the system of slavery that has existed since and before the creation of the United States of America. Then we want to discuss if there is a psychological block preventing individuals from acknowledging that slavery still exists or are they simply uncaring, apathetic pricks like those who did not own slaves per se but tolerated its existence and even profited from it indirectly. Stayed tuned for our weekly profile in Abolitionism as we highlight Nat Turner. 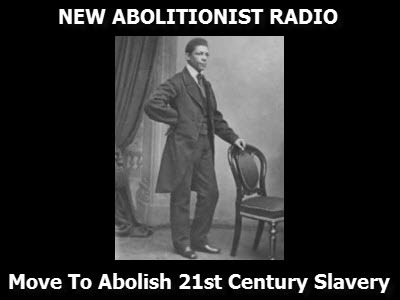 Join us tonight on New Abolitionists Radio as we discuss the issue and recent news related to 21st Century Slavery. Do you know what corporations are profiting from 21st Century Slavery? Do you know how prison slavery impacts joblessness in the United States? Prisoners in California started hunger strike and work stoppage. It is being reported that over 30,000 have refused meals until their core demands are met among them an end to long term isolation which the United Nations recognizes as torture causing psychological damage that can be irreversible. We will also discuss the women in a California prison who were coerced into being sterilized. 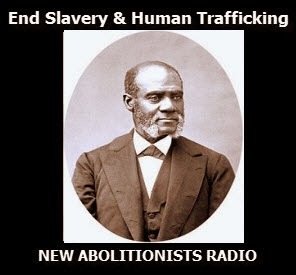 Tune in as Max, Aset and Scotty share their views and news on the issue of 21st Century Slavery and Human Trafficking and of course a profile of a past Abolitionist. We take a look at the public school system in a historical context and how the elite viewed it as a way to create a permanent slave class in America. Slave patrols in Hawthorne, California falsely arrest a Black man by the name of Leon Rosby and executed his dog in front of him.